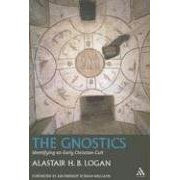 A student of mine has just returned Alastair Logan's book, The Gnostics, to my library. She had borrowed it from me a while ago when I had first received it in the mail, and before I had a chance to read it. So now I am doing so with great pleasure. I highly recommend Logan's book, which in part is a response to many North American scholars who have been attempting to purge the Academy of the Gnostics, at least as a category. Although I think that the North Americans have made a good point - that Gnosticism was not a religion, but is a modern category - I have chosen myself to continue to talk about Gnostics and their diversity. As I explain in several of my articles, and again in my book The Thirteenth Apostle: What the Gospel of Judas Really Says, the Valentinian Gnostics were a group that was within the apostolic church system. Although they met privately in some type of lodge or school setting, they also attended the apostolic churches, joined in their rituals, and interpreted scriptures in similar fashion. The Sethian Gnostics (who wrote the Gospel of Judas among many other books that we have preserved at Nag Hammadi), however, defined themselves outside and even against the apostolic churches. They met privately, had their own rituals, and engaged in reverse exegesis, reading scripture in opposite ways of the apostolic Christians. So for me, Gnostic is a very useful term, as long as we don't lump everyone in the same pot. This means that I am really glad to now be reading Logan's take, which appears to have many overlaps with my own. Logan uses sociological theories to distinguish between cults and sects, and argues that the Valentinians were a schismatic movement or a sectarian movement within Christianity, while the Gnostics (=Sethians?) were a cult functioning outside the Christian Church. I am not convinced that the origins of the Gnostics (=Sethians?) was in Antioch at the end of the first century. Against this proposal of Logan, I would trace their origins even earlier and to Alexandria. The last chapter is very intriguing, since Logan wonders aloud whether or not the Hypogeum of the Aurelii in Rome is a Gnostic burial site. If you haven't seen this book, but are interested in all things Gnostic (as I am), this is a must-read summer book for your list. It is short - only 150 pages - but engaging in so many of the right ways. A simple question for you. You write of "Valentinian Gnostics" and "Sethian Gnostics." I wonder what is the meaningful difference between those group names and, say, just "Valentinians" and "Sethians"? For, it seems to me that the latter are sufficient group designations that have an added bonus in that they do not create an unwarranted (or certainly unproven) connection between the two groups. I do believe that the "dependence" of the Valentinian system upon the so-called Sethian or Classical system is yet to be demonstrated. Further complicating the matter, I do not believe that there is any evidence that the Valentinians ever called themselves "Valentinian Gnostics," only (on occasion) "Valentinians." Finally, as this is my first post on your blog, let me thank you for your posting here. It is an important thing that you are doing here, I think. i like logan's stuff, this book especially (more readable than his gnostic truth). i also think logan's (and layton's) gnostikoi provides a useful category despite king, etc. re the previous comment, i have been revisiting this issue lately and my impression is that only a few scholars (i.e. petrement) doubt valentian dependance on the sethians (gnostikoi). would you say that's a fair assessment and what's you're stance on the question? I think it is fair to say that there is consensus among scholars of the Gnostics that the Valentinians were aware of the Sethian mythology, and adapted it to the Christian myth in a way much different from the Sethians. I think this is important because the Gnostic connection is a historical one in terms of similar mythologies - demiurgic systems where the creator is not the supreme god and is acting in ignorance or opposition to the supreme god. Valentinian Gnostics and Sethians Gnostics - these are etic categories to some extent. They represent our jargon today to talk about peoples in the past. I only add the word "Gnostic" when I'm in public discourse, since general audiences don't necessarily recognize who the Valentinians or Sethians are. Valentinians did not use this name for themselves. They called themselves Christians. Their opponents labeled them Valentinians and Gnostics. Sethians did not use this name for themselves. They called themselves Gnostikoi if we can believe Irenaeus. Their opponents called them Sethians. They might be the same group that they also called Barbeloites, Ophites, and Naassenes. sorry for taking time. I need a help and I thought maybe you could help me. I've been searching about Alastair Logan for a long time but could find nothing except his books. I am a university student and I really need his biography for my studies. Maybe you can help me about it. do you know any source (online and free- in my country the Visa or pay pal doesn't work)? Or do you have any biography or contact information of him?? I would be really thankful for that.